You must live in Oregon and heat your home with electricity or natural gas provided by Portland General Electric, Pacific Power, NW Natural, Cascade Natural Gas or Avista. If you do not own your manufactured home, the property owner or manager must approve the services before any improvements can begin. Your manufactured home must be pre-qualified before the evaluation can begin. To pre-qualify your home and receive a list of approved Energy Trust trade allies in your area, call us at 1.866.368.7878. 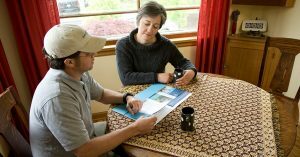 Our solar trade ally contractors can help you decide if solar energy is right for your home. In many cases, you can receive an initial analysis without a face-to-face meeting.